How do I know we have the best performers? Do we have the right sales and marketing strategy and processes for this changing market? Are our sales process and our people really effective? Do our people align well with our strategy and this changing market? Should we outsource or do we grow our sales organization ourselves? How can we increase revenues more rapidly? How do we maintain profitability? Are qualified leads becoming more difficult to source? How do I attract and retain very talented sales people? How did we repeat major sales wins? Why is wining so problematical? If I had more real horsepower in my sales team could we compete more effectively? How much specialized know-how do we need to break through what seems to be a roadblock in sales? Industry expertise doesn’t seem to matter as much. Why is that? Why Hire a Sales Coach? Sales coaching makes optimal performance possible by identifying, tracking and benchmarking performance against sales and marketing best practices. Our sales coaching is all focused on making an Immediate Impact on sales and marketing performance. Over the seventeen year life of the firm, we’ve assembled a terrific team of sales and marketing coaches with hundreds of years of combined experience. These professionals have full mastery of the immense OverDrive library of intellectual property and what tools processes will be right for you. These sales coaches are seasoned executives with decades of real-world sales and marketing success. They can help solve your most pressing problems and provide you with hands-on help coaching that should increase revenue immediately. Sales OverDrive coaches can also provide your company with some unique sales acceleration tools (“OverDrive key accelerators”) not available any where else. These unusual Sales OverDrive properties can help ensure that your company always wins. The OverDrive Key Accelerators are tailored to fit your company. Our sales coaches are committed to assisting you become best in class in your markets. Improve marketing, sales and overall team and leadership performance. Gain a sustainable competitive advantage in the marketplace. Expand trust, influence and communication within the organization and with prospects. Identify, develop and advance fast-track, high-performers. Improve execution and achieve revenue and performance goals more quickly. Mitigate conflict and ease uncertainty in decision making. Uncover blind spots and weaknesses that may be stalling your organization. In the first 90 days, three major deals closed, the pipeline doubled and sales cycle time dropped 40%. In year one, new revenue grew by $30 Million with over a 1000% ROI on sales and marketing investments. In year two the firm had achieved over $45 Million in revenue. New revenue doubled again and market dominance was achieved by the end of year three. Thereafter we provided Sales Coaches and Sales Trainers to keep the company on track and help accelerate momentum. Today the company has a revenue run rate of over $500 Million. Sales OverDrive’s Sales Coaching services are scalable and can be tailored to solve your most urgent sales challenges immediately. A repeatable sales process that substantially cuts your sales cycle and delivers a sustainable competitive advantage to your organization can be built for you very quickly. Short-term revenue can be jump-started, performance greatly increased and a more predictable and substantial profitable revenue stream achieved. Working with Sales OverDrive gives you the ability to team with proven sales leaders with successful experience in your industry that you might not be able to afford otherwise. It also allows you to refocus your sales force on behaviors that are predictive of revenue growth, thereby producing new customers more routinely. Moreover, with our assistance you can build the sales infrastructure and sales process you need to become the dominant player in your markets. On an ongoing basis and at a low monthly investment, you can rely on Sales OverDrive Coaches and Trainers to assist with coaching, advice and training in those areas that are most problematical. Gain a supportive, loyal ally and partner who will assist you address key challenges directly and openly. He or she will provide you with an additional source of encouragement, assistance and accountability for your team. Improve sales and marketing effectiveness and overall performance leadership. Increase your ability to achieve and sustain peak performance. Realize faster, more confident decision making. Improve time and priority management skills. Set achievable goals and commitment to performance and accountability. Gain a greater understanding of the strengths, weaknesses, challenges, threats and opportunities that face your company. Have greater visibility into behaviors that impact your goals and objectives. Access a skilled facilitator to assist in brainstorming, goal setting and strategic planning. A sales coach is an individual within a business who has the job of improving the performance and skills of employees. The actual role of a sales coach is often different depending on the individual company, the goals of the coach and the industry of the business. Several coaching philosophies and techniques exist. The role of a coach is different from that of a trainer. A sales trainer provides presentations that give employees different ideas or tools that each person can employ later while working. The training lasts for a certain amount of time and then ends. Sales coaching deals with each employee individually over a long period of time. Coaching sessions might be a regular weekly part of a job. The ultimate result is to make an employee better at sales and to improve the overall profits of the business. There is not always a clear route to become a sales coach. Most coaches are promoted to the position from within the company. Others specifically seek training and certifications in different management and human resource techniques in order to become more effective at coaching. The general requirements for a sales coach are excellent communications skills, an understanding of business and strong sales or marketing experience. Many coaching positions have requirements that are similar to what is expected for managers, team leaders or supervisors. Executive sales coaches who help managers and executives to develop effective skills often have a history of experience providing coaching to businesses. One of the most common ways that a sales coach works with the employees in a company is through one-on-one meetings or communications that are held at regular intervals. 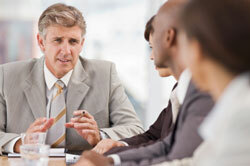 The meetings are a combination of a performance review, training and a feedback session. An important thing to note is that sales coaches are not supervisors or managers during these sessions. The intention of coaching is to foster a positive environment that encourages individual employees to learn new skills, improve weak areas and excel as part of the company. Punishments or disciplinary actions are not part of most coaching techniques. During a meeting between a sales coach and an employee, what normally happens is an assessment of the strengths and weaknesses of the approach being used to generate sales. Performance metrics are also examined. The coach and the employee then establish sales goals for the next week, month or quarter. These goals are assessed at the next meeting to see if the employee has improved personal performance. If the effort was successful, then the goals are increased or changed. If the goals were not met, then the coach will offer sales tip, tools or other advice in order to help develop the skills of the employee. This process continues and can sometimes shift focus from pure sales to areas that are more specific such as improving upsales or reducing handle times. It can sometimes be difficult to measure the success of a sale coach throughout the year. Changes in seasonal business volume, marketing and other factors tend to skew results up or down. This makes it hard to isolate the exact impact of the sales coach. One way that some coaches attempt to determine the success of different techniques is to segment the employees of the business into different groups who are given specific goals or strategies for a period of time. This helps to measure whether the coach has developed effective techniques that are providing measurable results. If you’ve experienced moving into a sales leadership role for the first time, whether formally or by default as is the case for many CEO’s of smaller companies, you have undoubtedly learned that this role is largely one of a sales coaching professional. So we’ll refer to it that way in this article. You will also have experienced the pressing demands on you to play not one, but a variety of new roles, many of them essential. So let’s group these four roles into what I like to call Champion, Mentor, Facilitator and Evangelist. Great sales coaches set an example and the pace of the organization for their team members. They do this with their integrity, determination and personal sales excellence. We normally do not see companies that are winning at sales without exhibiting superior abilities in this role. Notable exceptions are those company CEOs who hire superb sales coaches from outside the company. As an effective Champions, you must exhibit superior selling experience by leading the sales team in closing new sales, exceeding company performance objectives and otherwise modeling those behaviors you wish to see in the life and behaviors of your sales team. Champions are their sales team’s greatest ally and supporter. Become your subordinates’ biggest fan by also being theirs while still holding them accountable for compliance, execution and sales excellence. As a sales coach, you are singularly responsible for the professional development of your team. As mentioned above, your focus on modeling those behaviors, core values and guiding principles that you ask of your team will leverage your effectiveness. Think about your personal responsibility in this area and methods to ensure the maintenance and enhancement of your personal credibility. If you don’t have a sales coach or mentor of your own, then by all means get a good one. Look to the processes being used and the personal behavior of your sales team members – not the outcomes only – to assess where the opportunity for a team member’s improvement may be. Remember that pain points arise from one or more process issue. The issue could be embedded in the sales process itself or in less than perfect execution of the process. As each buyer is unique, also be quite certain that your company’s offering and the prospect value application aligns with your team member’s prospect buyer. This might entirely shift your diagnosis and thinking as you solve the problem and mentor your colleague. Finally, do your best to make sure that your thinking and sharing of knowledge in the particular area of opportunity is as collaborative as possible, allowing your team members to determine for themselves what the problem may be and how best to remedy it then and in the future. Surely, there is nothing more rewarding than seeing a sales person developing on their own due to your example and grounding in the insight you share. Additionally, some aspects of this administrative role are not my favorite. But the role can be very rewarding as it is essential to the capture and reuse of best practices, and serves to analyze important information about performance against objectives. One can have little basis for effective mentoring without good analytics. Understanding sales behaviors and activity, velocity and other metrics necessary for confident revenue forecasting are all dependent on accurate collection and analysis of the right data in a timely fashion. More importantly, accurate reporting and analysis about market and competitor shifts can alert you to events and trends that could be disruptive to company performance and often permit you to see windows of opportunity that might otherwise have been missed. Charging your team with collecting key market, customer and competitor information can be a game-changer when made a superior competency. Some call this role that of a “change agent” and there is certainly plenty of that in the life of a sales coach. Moreover, this is the role in which sales coaches can increase a company’s competitive advantage. You have the eyes and ears of the market place. Your customers confide in you and your team. So as it concerns your organization’s decision making process in areas such as product and service development for example, you have the opportunity to evangelize changes for the benefit of the customer, potentially delivering a competitive advantage to your company. Of course, it’s one thing to deliver value to a customer. It’s another thing entirely to be recognized for the value you bring. So as you drive to deliver value to customers with increasingly refined messaging focused on each customer’s key objectives, be sure to evangelize the value of your company and the product and services you bring. There are several good score carding process we’ve built over the years to measure delivered value. As a sales coach you will need to inspire your people and verbalize the vision and mission of your company. Nothing seems to empower sales professionals as much as enthusiasm for their company, its leadership and its offerings. Naturally, your team members will mimic you in much of what they do, so becoming “evangelical” about your company in word, action and belief is all important. Finally, its quite difficult to be on the same page with your team when it comes to evangelizing your message and the company’s vision internally and externally unless you have a common language that calls people to act and think very differently. Let me suggest that you look to the language of your sales process to see if using its vernacular actually changes people – especially how they think and interact with people in different functions – as they use the language. If 1) it has no effect or 2) requires no lexicon to understand and use it, or 3) it reuses words that just about everyone thinks they know the meaning of, you may be long overdue for a change in the language of your sales processes.